Celebrating Six Months with No Dye! Woo-Hoo! I’m celebrating six months with no dye! That’s a big deal, after 25 years of hiding my natural hair. For me, the first couple of months were the hardest. It’s hard to shake those beliefs, but the good news is that if you stick to your guns, you will realize that you aren’t letting yourself go. Instead, you are letting go of those dumb beliefs. Going cold turkey isn’t for everyone, but it was the best decision for me. Part of the reason I wanted to stop dyeing was to stop wasting time and money on hiding my grays. I’ve really enjoyed only having to go to the salon every 6-8 weeks for a trim, and only spending 45 minutes in the chair instead of two to three hours! And instead of spending a LOT of money, I’m spending around $65 including tip for a great haircut. Am I startled sometimes when I look in the mirror? Yes! That’s another reason I’m glad I’m keeping my length and doing the transition slowly. I liked being a brunette, and I need time to get used to no longer being one. I was born with a ton of dark hair, and I went to school with a lot of blonde kids so I really held onto my identity as a brunette woman. Well, I’m saying goodbye to her now, and goodbyes aren’t easy, so I’m taking my time. Since I stopped dyeing, I am losing less hair! Yay! I was losing a ton of hair after each shampoo, but now, there is hardly any hair in the tub AND new hair seems to be growing in. My gray hair is SOFT and SILKY. Who started the rumor that gray hair is coarse and wiry? I think this idea comes from the fact that when you have new hair growth, your little baby hairs stand straight up for a bit until they grow long enough to settle down. But I (and many other silver sisters) have noticed that our gray hair is nice and soft. I only wash my hair twice a week, to keep my hair from drying out. During the week, I use Neutrogena Clarifying Shampoo because I heard that it can fade color. It’s not recommended to use clarifying shampoo too often, so I try to switch it up and use a different shampoo every other time. I also love Living Proof Perfect Hair Day Conditioner, as it makes my hair very smooth and manageable. Once every weekend, I use Joico Blue Shampoo and K-Pack Conditioner– I wrote a post about the process here. Before I blow dry or curl my hair, I use Enjoy Protect & Shine – I still hate the sweet smell, but I love the way it makes the silvers sparkle! I still stink at using a curling iron, but I’m getting slowly better. This is the 2nd one I’ve tried, and it’s good! It’s not the fault of the curling iron that I’m unable to use it correctly. Watching this video helped. By far, the biggest change in my routine is that I wear a hat whenever I’m in the sun, to protect my silvers from yellowing. I should have been wearing a hat anyway, but I always feel like a dork in a hat. But I no longer care if I look like a GIANT DORK, so I keep a hat in my car at all times. It’s a cute pink hat, so what was I afraid of, for Pete’s sake? Even though I’m enjoying this process, I know it’s not for everyone. You will never find any judgments from me about women who dye their hair or go back to dyeing their hair after trying to go gray. It’s a personal decision and you have to do what is best for you! Blogger Debbie Roes expressed mixed feelings about her transition in this excellent blog post. She has some very interesting insights that you should check out. If you’re transitioning to gray, how are you feeling about your transition so far? I’d love to hear from you in the comments section below! So happy to find your blog! I have let my gray roots grow and grow for 6.4 months now and my hair grows very fast so the roots are around 4 to 5 inches now! I want to stop the hair coloring too but although the front and top of my hair is a nice white-ish gray, I am told that the back is more of a salt and pepper, which really isn’t too pretty. I’m not sure what to do about that. Any ideas, ladies? Hi, Jan: I say let it keep growing – you won’t have a good idea of how it will look until it’s a bit longer. Personally, I like the idea of the contrast between white hair in the front and salt & pepper in the back. I’m not sure what advice to give you, except a layered bob (longer in teh front and short in the back could be really striking! Hello all you silvery and pre-silver foxes! 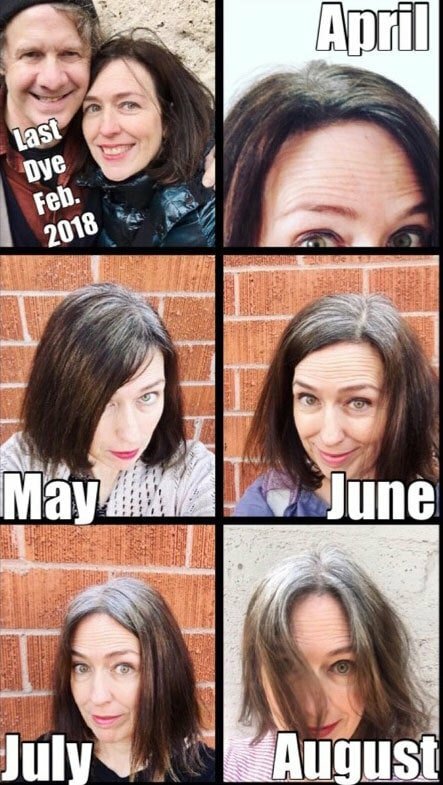 I’m 51 years old and stopped dying my hair more than a month ago. I told myself that once I saw consistent solid gray roots, then I’ll start the transition to go permanently gray. I am a bit nervous, but I’ve come to a point in my life that the only one who should be judging me on my looks is me! Thank you for providing this site as reading the comments provided the “extra” encouragement I needed! 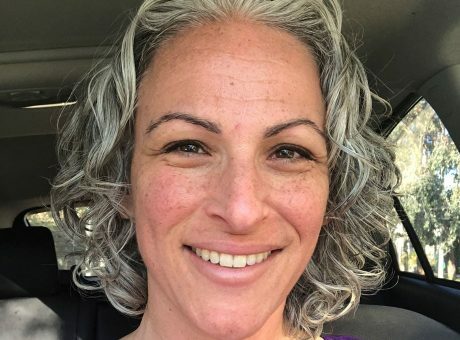 I decided to stop dying my hair last November – after 28 years! My stylist did a color stripper to remove more of the auburn color left in my hair to make it a little bit easier to transition. I’m thrilled with the progress and hope to be totally grey/white by my 40th high school reunion later this summer! It’s not a solution for everyone, but I’m very happy I took the leap of faith! Congratulations, Catharine! Sounds like you made a great choice! I’m 70 years old. Have been dying my hair since it turned 35—half of my life!! I’m 6 months in and it has been an interesting ride! I knew that I was totally gray in the crown area. It had been suggested that going lighter would make the transition easier. What I didn’t seem to remember, is that my actual hair is very dark brown!! So….I have 6 months growth of dark salt and pepper hair, which I love, with the crown of white and 4 inches of light brown. It’s hilarious….but, at 70, I seem not to really care. (too much) I have found a product called Everpro. It is actually a spray paint that washes out but doesn’t have a residue that comes off on pillow cases, etc… I spray it on my roots, if I’m wearing my hair down. Usually, I pull my hair back and it “is what it is”! Aging is a process. I am embracing it and looking forward to the day that my hair is fully natural. God help me!!! This isn’t for sissies!! I’m 45 years old and decided that I no longer wanted to dye my hair. I went cold turkey mid January 2019. I often feel like giving up, but then I find blogs like yours that give me that push to continue with my decision. I have decided to start eliminating little stresses in my life, and dyeing my hair is one of them. It’s no longer a joy. Spending so much money and only getting a week to enjoy the color before seeing the greys again. Just a one question. Should I start using hair products for grey hair already? Hi, Miriam: I agree with you on dyeing no longer being a joy! It’s so nice to be done with it. Re: hair products, I think you don’t need to worry too much about switching products. Just see how your hair does. Since I was a dark brunette, my hair started turning brassy orange pretty quickly, so I started using blue shampoo on it a few months into my transition. I’m a former natural redhead who stopped dyeing Dec 2018. I kept seeing beautiful redhair on women but as one commenter said, at some point your hair doesn’t match your face and it just looks wrong. At almost 63 I also didn’t want to be 70+ going through transition. I’m excited to discover the new me. My friends are all ‘no no you’re too young’. No I’m really not lol. Now that I’m doing it I see it everywhere! I bet it looks great, Debbie! I have that same phenomenon – everywhere I go, I see women in transition. Don’t know if there are more of them, or I’m just noticing it? Congratulations on making it to month 2, Irene! You have a great attitude. Isn’t it freeing not to worry about dyeing any more? Love this site , because going grey is a challenge, I have tried about 9 times and have always , “chickened out” ; however this time I am going to stay focused on my goal. I believe embracing your true age with style ,grace and gratitude is freeing ! Hi, Jeri – it is definitely SO freeing!! Good luck on this go-round. If you haven’t already, join us on Silver Revolution at Facebook for support. It helps! Hi Katie. not sure what happened, I typed a comment and it dissapeared so if you find two comments from me, you know why…lol. 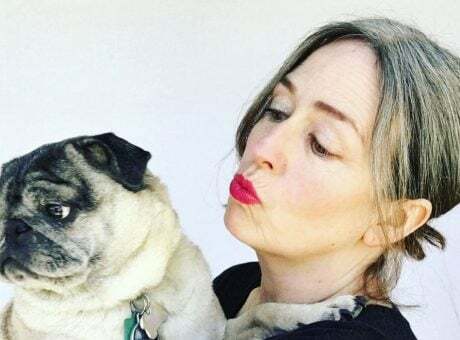 I’m attempting to go grey again, I lasted 8 months the first time , but gave up as Ive picked up a lot of weight and was feeling old and dowdy. This 2 nd attempt I’m going grey and am losing weight with it. Starting on Monday 7 Jan. Wish me luck! Good luck, Kathy!! You can do it! Are you on LoseIt.com by any chance? I use that to great success to stay on track with weight goals. I hate that someone made that comment to you. What are people thinking? Good luck this time and make sure to join Silver Revolution on Facebook or follow silver sisters on Instagram. The support really helps! You go girl dont listen to people deep down they want to do it but haven’t the courage to do it . I am one year into my transitioning it half way there one more year and it will be down to my shoulders I refused to cut my hair short. I’m 6 months out since my last dye as well. I too have been surprised by how soft my hair has become & it seems easier to style too. I’m a redhead or a transitioning one & I’ve always been afraid my hair would turn white but it seems like its turning kind of golden or strawberry blonde but with white around my temples. My husband prefers my red hair but unless he’s willing to fork over the $150-180 bucks to have it done every 6 weeks then he better get use to the new me because I I’m not paying that anymore! I always think the redhead transition is very pretty – my Mom is a natural redhead, and her hair turned a strawberry blonde as well when she initially turned gray. Agreed on the money – I can’t believe how little I spend now that I just get haircuts! I am a brown skinned Indian with dark brown dyed hair, a color I’ve loved I have to add. But have decided that after some 30+ years it’s time to let it go. So of course I turn to social media and find there are so many of us out there trying to figure out the best way to do this! I find that stark ‘demarcation’ line the hardest to deal with. But thanks to your blog, and the many others out there, at least I know I’m not alone! Thank you for the support! I’m so excited to find your blog. I always felt my least authentic and refreshed when I had a tiny white stripe of grey coming in. At age 44 and after 20 years of dying rapidly appearing greys brown and even going blonde for one year, I FINALLY got up the nerve to stop having my roots done. Even when I was diligent about hair appointments I had white hairline after a week and always have my hair up so could never hide it…it was getting ridiculous and expensive and messy! I went cold turkey a month and a half ago, I think? 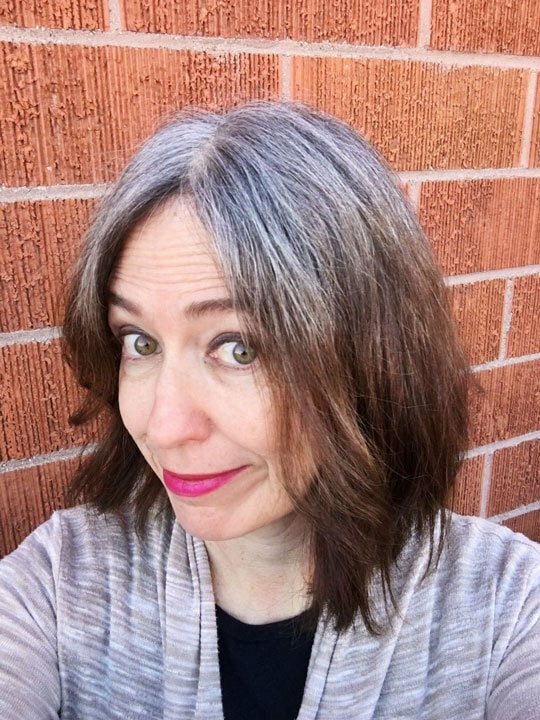 I had my stylist break up my dyed color with a few highlights but it doesn’t really blend the white/grey, but now that I’ve embraced it, I LOVE it. I have not looked back and made a big announcement to my stylist and to a bunch of pals so they would hold me accountable. ALSO, I have a friend who went a stunning grey after chemo and she is super excited I’m trying it out, so in some kind of solidarity I want to do it too. I am eager and the awkward feeling is fading. It was 100% worse panicking on the day of a presentation or a special night out to cover that part, etc. I’m also in a big but positive life change and the timing feels right to be my most ME. Finally, my two young girls, whose curly African hair is so beautiful and which I’m always telling them to NEVER change, are ever supportive. They are so bold in their comments– “Mom, woahhhh, I can see SO MUCH WHITE” and “Never change your DNA! I like it white! !” –but so positive. I have run out of reasons to fight it and now I LOVE what I see around me and what is to come!!! Your blog is perfect. So positive and laid back and practical!!! I love it!! Thank you!!!!! Thanks, Leah! So glad you like it! I’m glad your little girls are so supportive. It sounds like you and I had the same kind of epiphany – at first, it’s scary to embrace your grays and then you get EXCITED about it! It really does feel like finding a “new you.” Good luck with your transition! Just started transition after about 28 years of dying my hair. All of a sudden my 63 year old face didn’t suit my 20-something hair color. I am going to a colorist who does wonders in masking the transition. My actual hair color is platinum white and I’ve been dying with #4 dark brown so it’s a big change. But I’m so ready, cannot wait to see it when it’s all grown out. It sounds like it’s going to be beautiful, Mary! Hey there, I found my first grey hair in 8th grade and have been dyeing my hair for a long time, I’m 35 now. I am cutting my hair into a pixie cut so I have less transition time. Then once I know how it will look I’m thinking of doing some brown bayalage to blend into it. My skin tone does not look great with grey at the front. I’m excited though and look forward to a less expensive hair appointment. Paige, that IS exciting and it IS nice to save the money! Pixies are a good route to go if you want a faster transition. Make sure to check out Marci’s transition story on the blog if you haven’t already! Congratulations. I’m doing the same thing. I’m only at 3 months. You are right. There is a stigma with going white. Hopefully, I can keep this going. Congratulations and good luck, Yvonne! It will be easier with this great new gray-hair community going on online. I’ve noticed more and more women (even in Los Angeles) starting to accept their white/gray hair. Let’s hope it continues! I’m two months into my no dye transition. Cold turkey is also the best way for me. I’m very excited to be completely natural, but I wish it would happen faster. It is a little like watching a water boil, waiting for the grays to come in, but I’m confident it will be worth it in the end. It IS hard to wait, though. I love this!! Thank you for writing! I love that you expressed how you loved being a brunette and you just needed time to let go of that identity. That is exactly how I feel so it helps to know I’m not alone. Thanks, Eva! I’m glad you enjoyed it. It IS hard to let go of that part of yourself. I’m 31, graying since ~21, and dye-free for just over 3 months. I’m feeling surprisingly good about it so far! 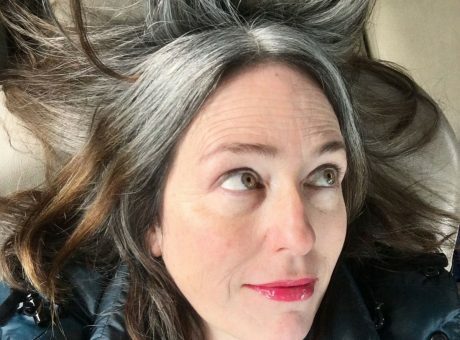 I’ve always thought that a full head of silver hair is such an elegant look, so I’m excited to get there – just have to get over that hump first! I’m only now starting to be slightly self-conscious of my roots, as i’ll soon be approaching the point of “half & half.” At any rate, I don’t know where I’d be without the supportive groups on Facebook and blogs like this one that help me to feel encouraged and inspired in my decision to ditch the dye! It’s great that you are starting so early. I think this generation of young women will help break the idea that gray hair is only for the elderly. Good luck with your transition!